Day 3 and another 3am wake up call. Honestly by this time when my alarm went off I was about ready to throw it across the room. 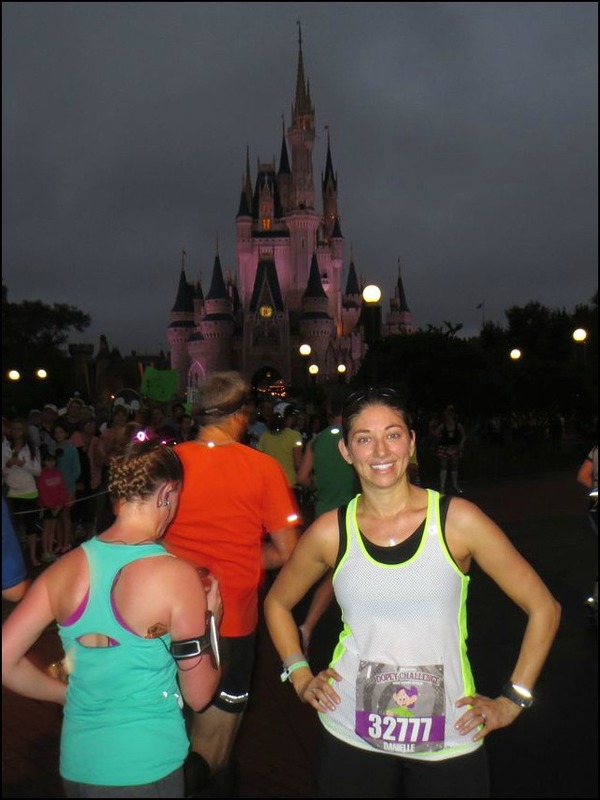 I’m not a morning person to begin with (not that this was morning so much as middle of the night…), and it certainly didn’t help that I wasn’t particularly thrilled with the course crowding and lack of characters during the first two legs of the Dopey Challenge. But, up I got! Today was half marathon day! 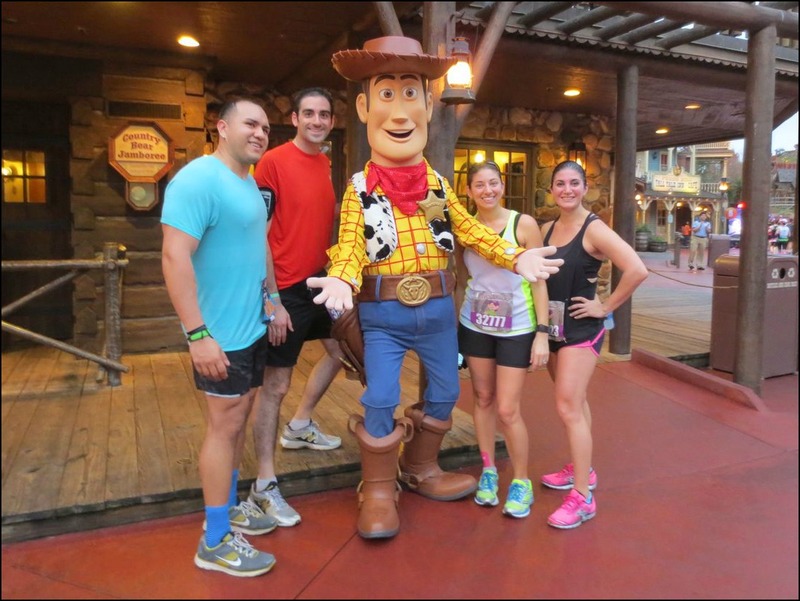 I met my running crew at the start area and we began the LONG trek to the corrals (if you’ve never done the half or full at WDW Marathon Weekend it’s about a 20 minute walk to the corrals!). …we finally did make our way in (after basically being attacked by the corral bib checkers – man were they aggressive!) 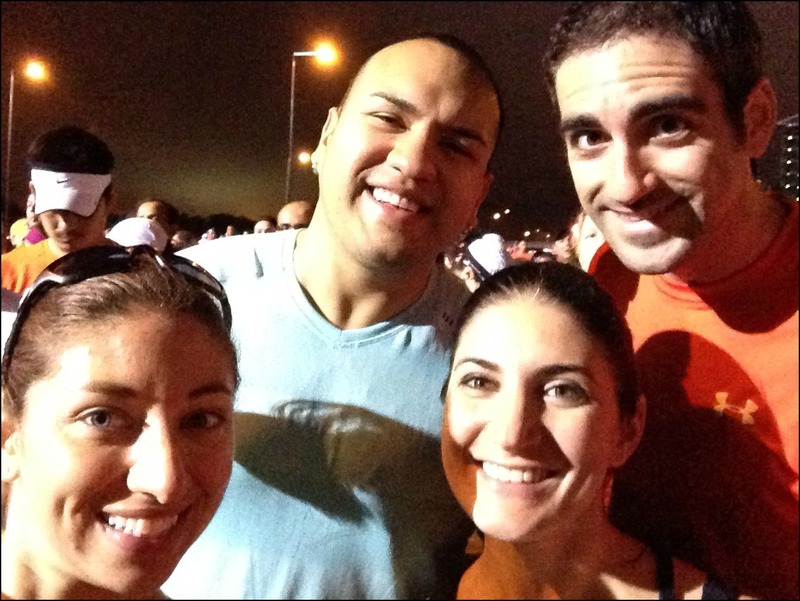 and took our usual pre-race corral selfie! Starting at 5:30am we waited for the 8 corrals ahead of us (yes, 8!) to go and finally we were off! The only way to describe the beginning of this race is SLOW and CROWDED. And if I wasn’t already upset about the corral placement for the Dopey Challengers (see my Angry Corral Rant HERE) let me tell you I just about lost it when around mile 2 I realized the 2:45 pace group was in our corral!! Now please understand that I have absolutely no problem whatsoever with anyone who runs a 2:45 half marathon. If you’re off the couch and doing something (anything!) I’m happy/ proud/ excited for you! But, having submitted a 1:59 half proof of time, I don’t exactly agree with my placement in the same corral as the 2:45 pace group. That is all I’m going to say about that (for this post at least). My anger subsided when we got to the Transportation and Ticket Center and Jenn‘s dad, for the 2nd year in a row, handed us THE WORLD’S BEST RACE SNACK – A DOLE WHIP! And then, we proceeded to take THE WORLD’S BEST RACE PHOTO! 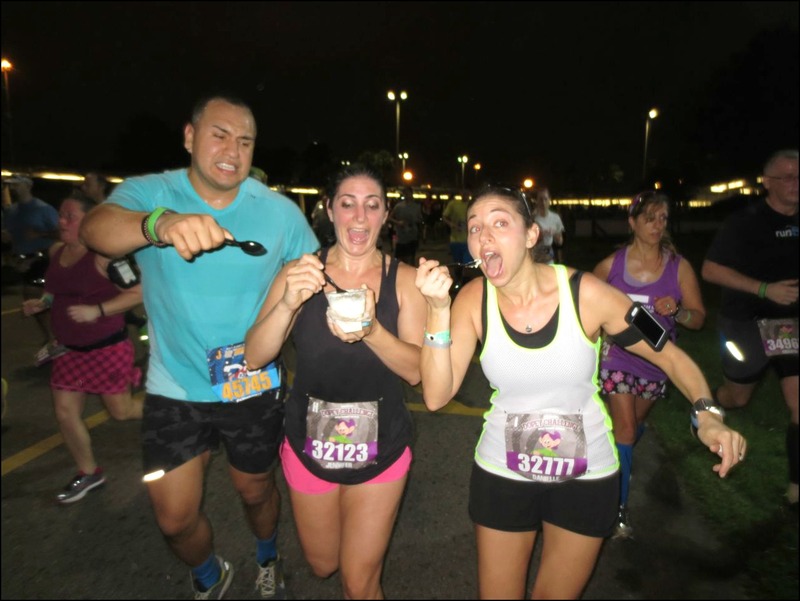 Roy, Jenn and I running and eating our mid-race Dole Whip! Roy clearly has yet to learn that you don’t come between Jenn and I and a Dole Whip! …through Tomorrowland and the castle and made a quick stop for a picture with Woody before we headed out of the park. Coming out of the Magic Kingdom we ran by the Grand Floridian and the Polynesian where Jenn’s dad met us with…ANOTHER DOLE WHIP! 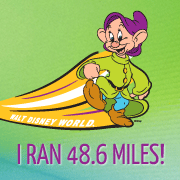 After a second round of Dole Whip there was just a few miles of highway between us and the finish line! Well, a few miles and a few pushups of course! 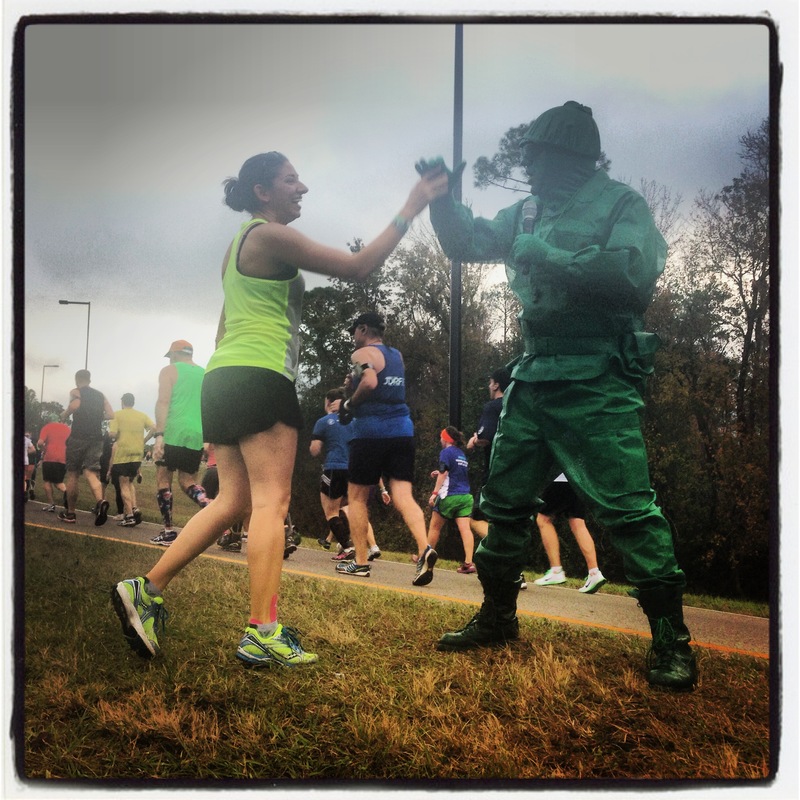 The green army man was pretty psyched about it, gave me a big high five and sent me on my way! We headed under Spaceship Earth and out towards the finish line in the Epcot parking lot! 3 races, 3 early mornings and still smiling! My overall thoughts on this race? It was crowded basically from start to finish for me and I definitely think there were less characters than last year. I heard from others in corrals ahead of me that they didn’t find the course crowded at all so I’m chalking it up to being in a corral of runners running at a slower pace than I was trying to run at – definitely made for a lot bobbing and weaving! 22.4 miles down, 26.2 to go! 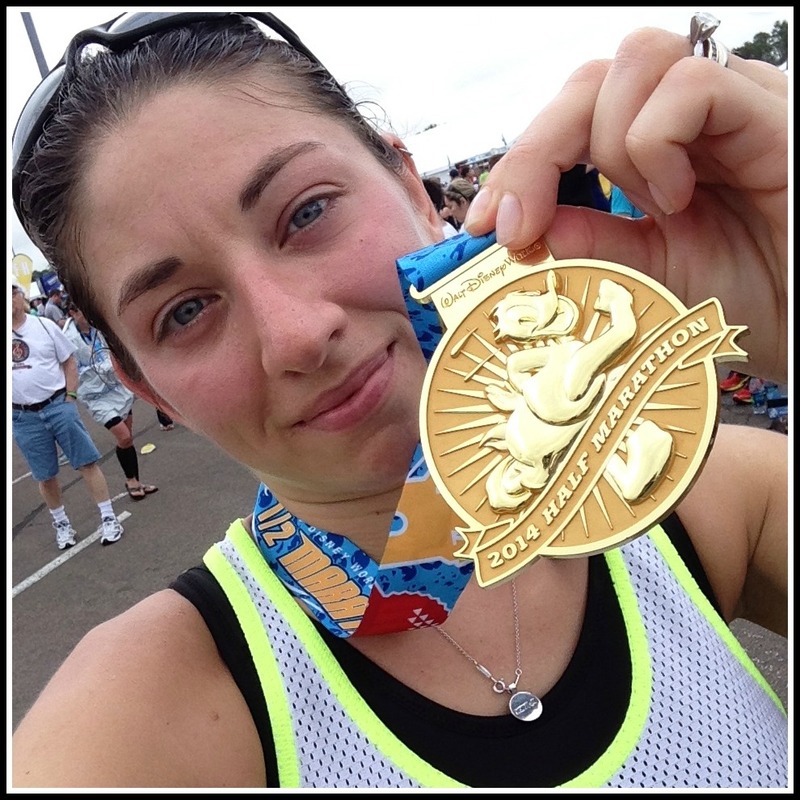 If you missed my recaps of the 5k and 10k be sure to check them out! Wow, I can’t believe they weren’t checking bibs when you got there, we basically got attacked! And yes, I agree, I don’t think the corral issues are solved yet! All weekend, I saw TWO people who had clearly had their corrals changed–the stickers were blue with the running Mickey on them and a new letter. I’m not sure how they got them, but a lot of people were REALLY angry about their corrals-especially people who were in P because they forgot to submit proof of time. It was a riveting drama. Exactly, I don’t really appreciate being lied to, they swore up and down there were absolutely NO corral changes, which clearly was not true. I don’t necessarily think my corral should have been changed so much as they shouldn’t stick the challenge runners in the same corral for the half and full…it just doesn’t line up correctly. I think a lot of people thought they were placed in the wrong corral, but the biggest anger was from people who never submitted a proof of time and ended up in P. There were some really enraged people. No, I had the same thought and there were some really belligerent nasty people. I was hoping you’d have Dole Whip and Green Army man pics! I was up front and it wasn’t crowded at all (though a few character lines were still long). I’ve done enough RD races that I’ve found that when you’re moving at the pace of the runners around you, they feel less crowded. 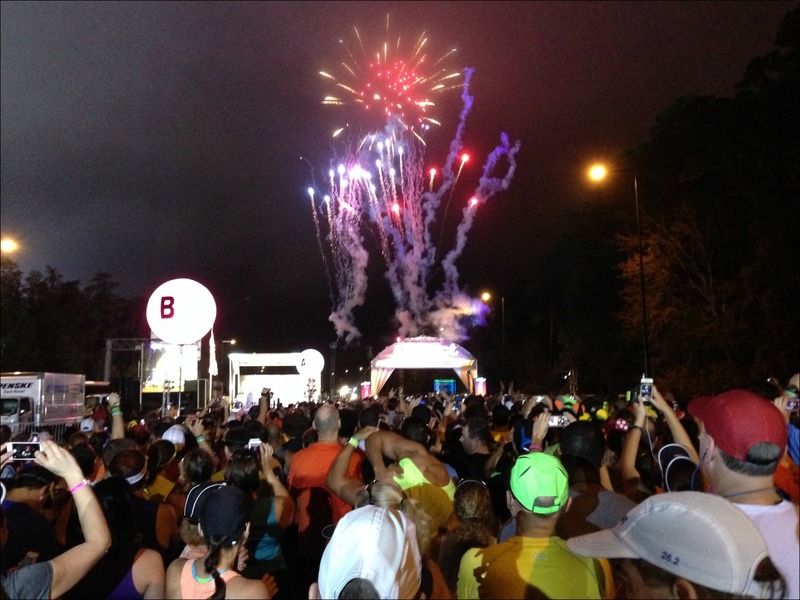 If you’re further back and passing a lot of people, it feels more crowded (wait for my 10K recap!). Also, if you’re further back, but moving at the same pace as the people around you, it doesn’t feel crowded (my 5K w/my mom). I’ve started everywhere in these races–from the first corral to somewhere in the middle to the last and that’s definitely true. I agree, the whole point of corral placement is to be placed among a group of runners running a similar pace to you – trying to run a 9:30-10 min/mile pace in a corral paced for 12:30-13 min/mile was not easy at all. Nope, not easy at all! I feel your pain. 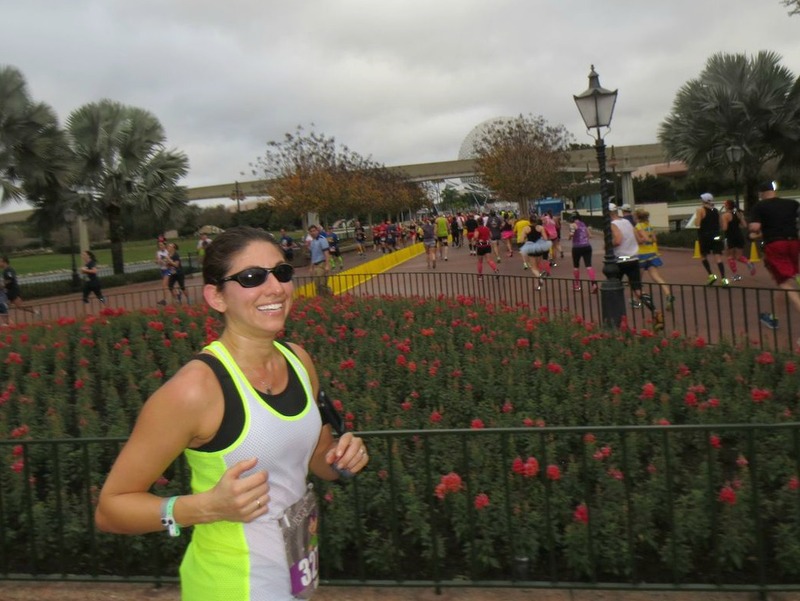 First off, I am SO JEALOUS that you got to enjoy a TWO Dole Whips during your race! I. am. obsessed. with those. So awesome! The course was definitely congested, and I started in G (which, I know you’ve covered it already, but WTF kind of sense does that make? I submitted a 2:03 half with no estimated finish time). In any case, the course was DEFINITELY crowded, and trying to weave around walls of walkers is never a treat. Of course, I know I can’t complain because I also choose to stand in those ridiculous character lines, putting me further and further back every time I stop, haha. Haha yes the Dole Whips are an AWESOME mid-race snack! And I can go on and on and on and on about the corrals…I’m trying to not let it get to me any more though because it’s over and done with. I just hope they make some changes for the future. 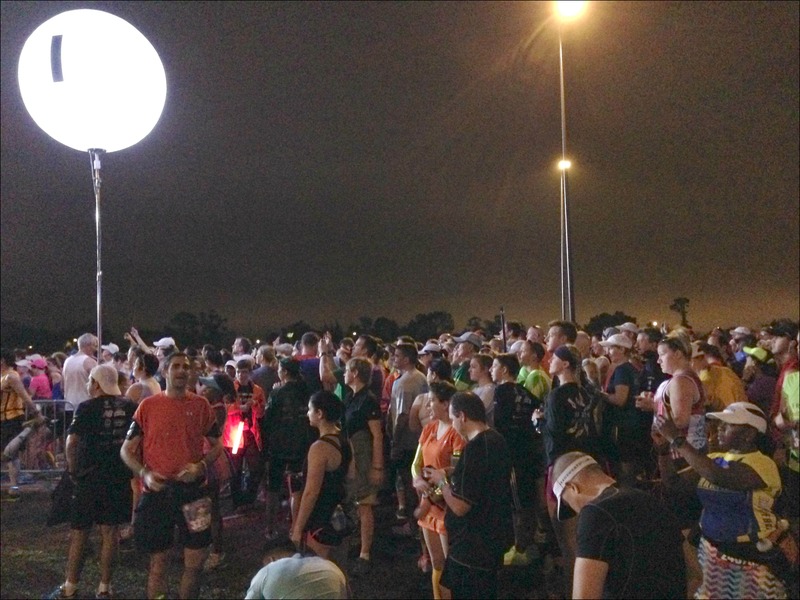 I’ll be interested to hear what the final word was from RunDisney on the corrals. It sounds like it was such a mess!! 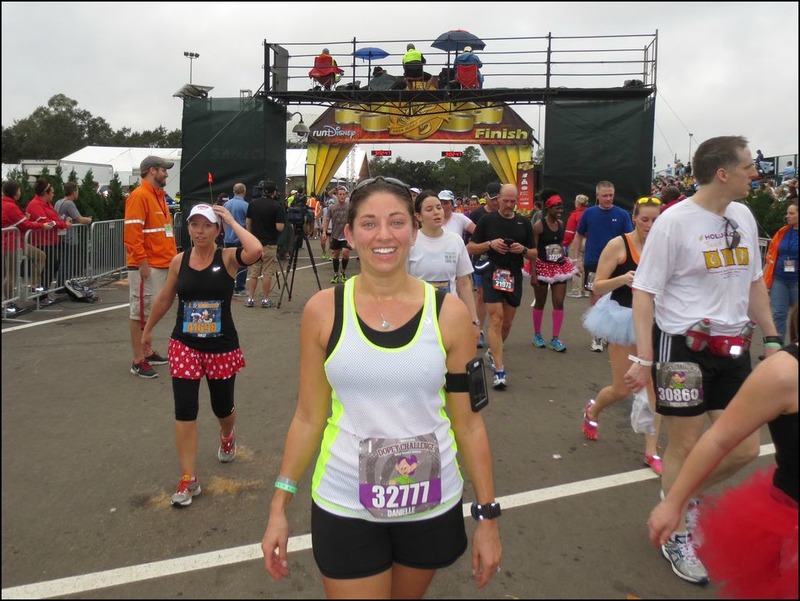 It looks like you had an awesome half marathon running around Disney World though. Two Dole Whips?? That would be heaven! Congratulations! Me too, I’m really interested in seeing if they make any changes to the corrals for next year. And yes, as much as I hated the course crowding and lack of characters I really did have a good time, it’s always fun running with friends! I’ve never heard of the Polynesian Whips! I’ll have to get them next time! That is a great spot for spectators because they can see us at the transfer station and the Polynesian! I agree that there were less characters all around this year. What gives?!?! My sis lives there (works at Animal Kingdom) and runs most of their races, she told me that when you see the Green Man you know you’re close to the finish! Yes! Captain Cooks, the quick service place at the Poly, has a Dole Whip machine! And yes, whenever I hear the green army men I know a) there’s a hill (they always put them on a hill) and b) the end is near! I’ll have to try the dole whip option one of these days. I agree with the corrals (fellow Dopey). I was in K with a 2:18 submission and I was less than thrilled to see the 3 hour group was in the corral ahead of me. It makes for a lot of bobbing and weaving in races. Yup, bobbing, weaving, grass running…not exactly what I was hoping for the day before a full marathon! And YES! 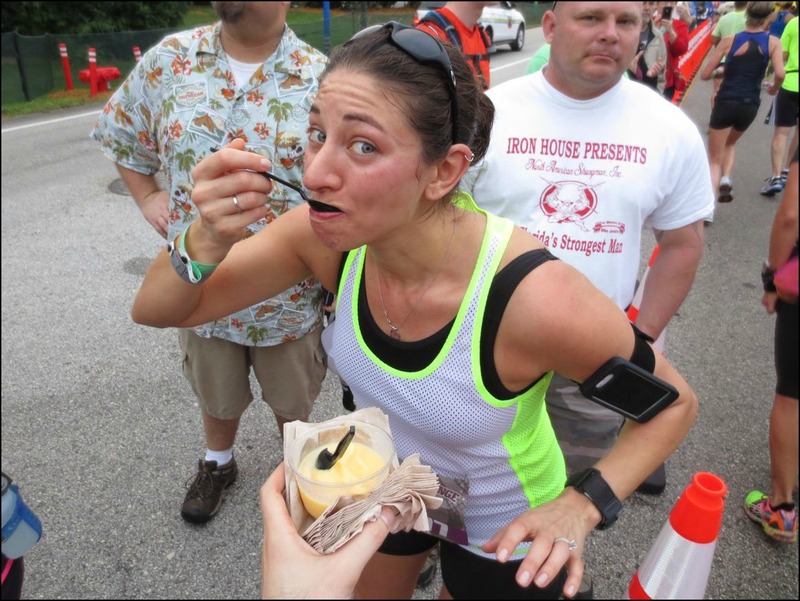 Dole Whips are the perfect race fuel! Maybe one day runDisney will catch on and have a Dole Whip stop on the course! I seriously love the Dole Whip photos…they are awesome!!! Your face in the medal shot says it all…not the smiley Danielle I know! You know, I hadn’t even really noticed the look on my face in that picture but you can definitely tell I was less than thrilled with the race. Dole Whips!!! Ugh, the corrals sound like a mess. 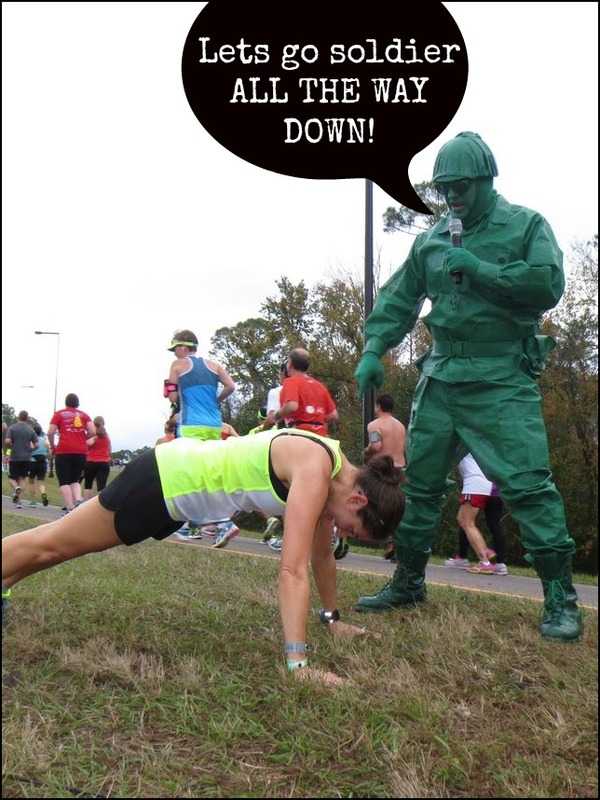 I love seeing the Green Army man pics & pushups! !